Makies are a new brand of doll from MakieLab, when I was contacted by them to see if I would like to create and review my own doll, I thought this would be a nice thing that I could do with my two older daughters. These poseable dolls are 3d printed and stand at 10 inches tall. Created completely by you, you get to choose everything starting with their hair, eyes and mouth, even down to the width of their smile and the clothes they wear. We were sent a Makies "Gift a Makie" which cost £69, included in this is a gift certificate which pays for the price of creating a Makie doll. 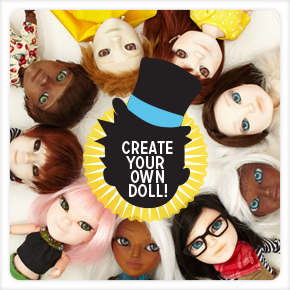 You can create your doll on their site like we done or you can download the makies app from iTunes and create your doll whenever and wherever you happen to be at the time. The process is quite simple and really fun, my daughter's and I had a good laugh at the way we made the doll look, some very weird and wonderful facial expressions seen. We have now sent our doll selection off to be made. Delivery costs £6.60 and once purchased your very own Makie doll should be with you within about 2 weeks time. Look out for my next review showing you just what these dolls look like in real life, to say the girls are excited is a bit of an understatement!!! Disclaimer : The doll making kit was sent to use free of charge for reviewing purposes however all thoughts and opinions are my own.